The present house on the southeast corner of the Square was built by the Stuart family probably about 1880, but George Jack, an early settler, is known to have had a house there in 1837. The next owners, George and Elizabeth Jack Boal, had a “large plaster house and stable” when they sold the property to Ezra Brisbin in 1863. Brig. Gen. John S brisbin - in the medical corps during the Civil War, successor to Gen. Custer, and later in charge of surveying all fences in the United States - bought the property in 1867. A number of owners had it following its sale in 1873 to James T. Stuart, the probable builder of the house now standing. In 1875, Stuart opened a drug store in one room of the home. This business operated successfully until 1882 when Stuart closed it and, with his brother John, opened a General Store in State College. This house with a center hall and an ell at the rear is noted for its steep central roof and gable and the extremely tall windows at both floor levels. This door opening onto the present porch roof once gave access to a full porch at second floor level. An unusual feature is the spring of fresh water rising in one corner of the basement which, in earlier days, provided the owners with a fine "spring house" for cooling foods. 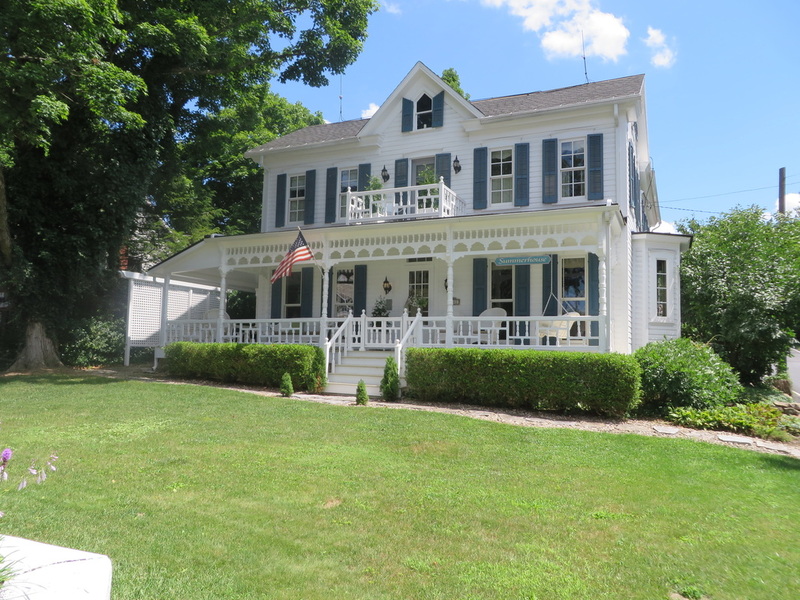 In 1910, after Mrs Emma Hunter Stuart (daughter of Dr. Reuben Hunter and one of the founders of Memorial Day in Boalsburg) bought it from William Baumgardner, it remained Stuart property until Nan (Mrs. William) Stuart sold it in 1953 to James and Helen Fritz. The present owners are Scott and Rita Culbertson, who bought it from Richard and Harriet Rosenberg.